Most fond of sweet things are fans and ice cream, and undoubtedly one of the most classic ice cream is creamy. No need to wait for the hot summer months because it is pleasant at any time of year and can be prepared at any time of year. Not surprisingly, the Russians consider that the ice cream is one of the best tools in treating sore throat. Here are three of the fastest recipe for ice cream at home. Ingredients: 1 1/4 hours. H. Caster sugar 2 1/2 hours. H. Cream, 3 eggs, 2 packets of vanilla. Preparation: Half of sugar crashed eggs and half and cream. Mix gently with vanilla. This mixture is poured into a tray or directly buy or glasses, which will serve the finished ice cream and leave in the freezer until cool enough. If you wish, you before Serve ice cream to sprinkle with grated chocolate. Ingredients: 1 1/4 hours. H. Caster sugar 2 1/2 hours. H. Cream, 3 eggs, 2 packets of vanilla, 5 p. L. Strawberry jam, 1 pm. H. In advance whipped cream, 50 ml liqueur, 50ml syrup raspberries or strawberries. 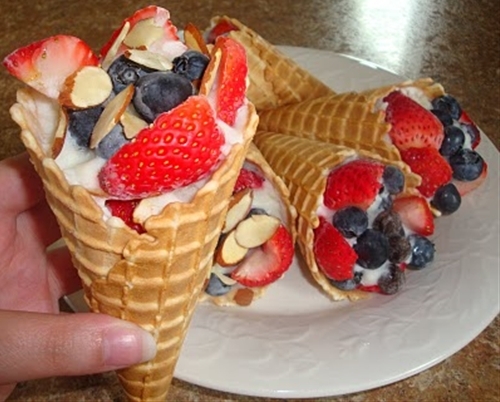 Preparation: ice cream is made in the same way as the previous recipe, but do not put in the bowls, which will be served, and in a large bowl with a lid and put in the freezer to cool. Separately put several glasses or cups for serving ice cream in the freezer and wait about 30 min. To cool enough. At the bottom of the bowls or cups pour 1 tablespoon sweet, and on it put the ice cream. Top put the cream using a syringe. Before serving bowls pour syrup and liqueur. If you want to look even more beautiful you stuck a few sticks of chocolate, biscuits or waffles on the ice cream. Ingredients: 1 1/4 hours. H. Caster sugar 2 1/2 hours. H. Cream, 3 eggs, a few drops of confectionery emulsion of rum, 8 p. L. Cacao and some milk in which to Cocoa blur. Method of preparation: cream ice cream was prepared as described in the first recipe way but instead of vanilla was added thereto and the emulsion of rum with fuzzy cocoa milk to give a chocolate ice cream.